The difficulties pale beside the richness of the talk. “Dinner at the Square” is our annual dinner series on a hot topic of interest. Defying the trend toward discussing issues most central to our lives in 30 second sound bites, we’ll discuss aspects of our annual topic for an entire season. For more info on “Dinner at the Square” click HERE. Take-out Tuesday is a regular part of programming at The Village Square. These events are more casual lunch-time gatherings available to anyone who can join us. Bring your favorite take-out dinner and a drink and join us to learn about a hot local, state or national topic – or another aspect of cultivating more thoughtful civic exchange. For more information on our upcoming “Sticky Issues in Civil Society” lunch series, click HERE. 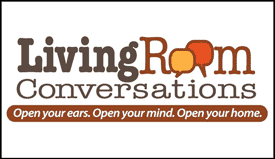 We’re thrilled to partner with Living Room Conversations to offer a way to bring a bit of Village Square home with you (like a to-go box). It’s led by a diverse group of champions including unlikely friends MoveOn co-founder Joan Blades and Tea Party Patriots co-founder Mark Meckler. Read about Living Room Conversations + Village Square HERE.